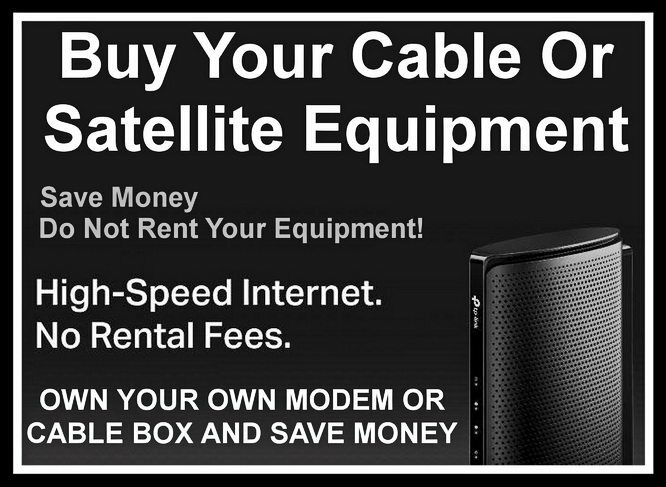 Buy Your Own Cable Or Satellite Equipment! If you’re looking to save some money on your cable or internet bill, buying your equipment might be the right option for you. We’ve provided some considerations below when thinking about purchasing your modem/router and Set Top Boxes. The FCC requires that cable companies allow their customers to buy routers/modems and set-top boxes instead of renting them from the cable company, but you’ll want to take into consideration how long you plan on using the equipment and what the company’s rental fees are when deciding whether to buy or rent. Buy Your Cable Or Satellite Equipment! If an all-in-one modem/router costs $10 to $15 a month, you’ll be spending anywhere from $240 to $360 a year. 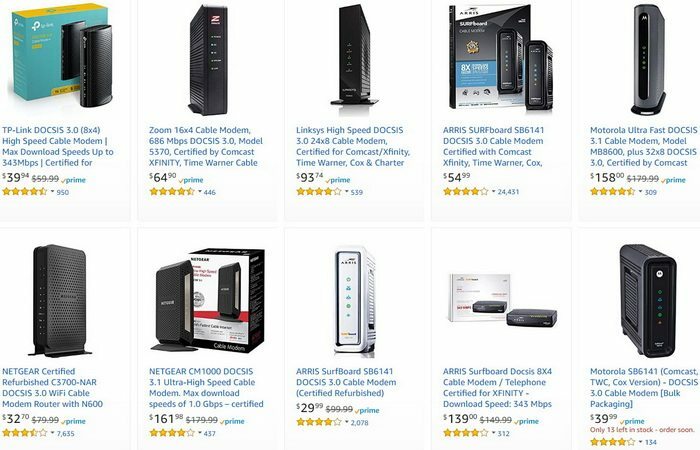 All-in-one modem/routers can be purchased for as low as $70. 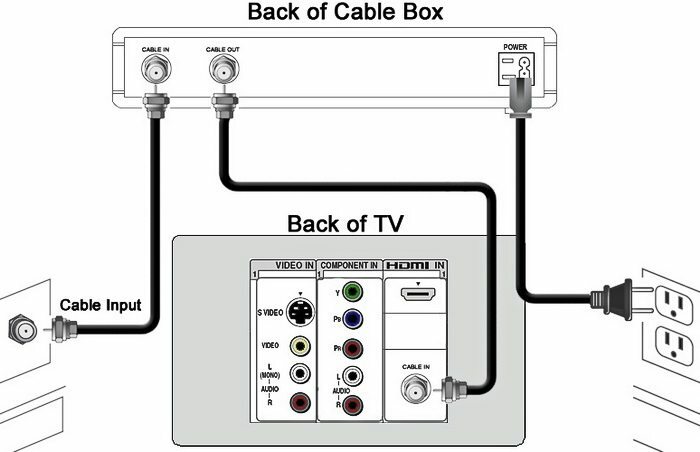 If a cable box costs $50, and you rent it for $4 a month and plan to have the box for more than a year (or 12.5 months) it is more cost effective to buy the cable box. When thinking about your modem, you will want to consider a few things. The first is to make sure your Internet Service Provider (ISP) will support the modem. Cable Internet service providers don’t have their own standards, instead sharing the DOCSIS (Data Over Cable Service Interface Specification) standard. This means as long as the modem supports the DOCSIS standard, it will work with your ISP. It’s important to understand what type of connection you have, be it Cable Internet, ADSL, fiber optic, or satellite, because they do require different types of modems. Your ISP will have sections in their documentation designed to help you make the right choice. IMPORTANT NOTE: When you select a modem, it is also important to consider the additional features you need, such as wi-fi support and the connection speed. Less expensive router/modems will have slow connection speeds and may not support wi-fi connections. While it may be tempting to cut cost by buying just a modem, a modem/router combination is essential if you have multiple devices that you will connect to the internet, either through the ports on the device or a wi-fi connection. Instead of buying two devices, there are plenty of devices that are both a modem and a router. Deciding whether to buy or rent a cable box may seem a little more tricky, and you’ll want to add the rental of a CableCARD to the cost, but it’s the same basic formula. Which is cheaper in the long run? Renting or Buying? CableCARDs are much cheaper than the whole device ($2-$4 on average, vs. double-digit rental fees for the box). Just remember that cable boxes with HD/DVR/Multi-Room DVR are going to cost more both to rent and to buy. Setting up your own equipment is simple. Your devices will come with easy to follow instructions and will just be plugged into the existing cables installed by your Cable or Satellite company. In many cases, a call to your cable or satellite company after you’ve plugged in the device will complete the setup. Just let them know you bought your own equipment, and give them the serial numbers on the back of the device. Below is a list of the top 6 cable/satellite providers, and our recommendations on which modems to buy for each provider. Because modems are upgraded continuously, we are not recommending a specific model, just a brand. Search on Amazon to find the latest model with the best reviews. Or, go to your cable provider’s help section and look for their “certified cable modems” or “supported devices”. As long as you follow the steps outlined here, you’ll be on your way to saving up to a couple of hundred dollars a year by buying your router/modem or set-top box equipment instead of renting it from the cable or satellite companies. Still not sure what to do? Contact below us for help.